You were born to make art. You were made to live art. You might not see yourself as an artist, but you are—in so many unexpected ways. In what you create, whether poetry or pie, sculpture or sand castle, calligraphy or conversation. It’s time to uncover the shape of your soul, turn down the voice of the inner critic, and move into the world with the courage to be who you most deeply are. See the artistic potential in words, gestures, attitudes, and relationships. 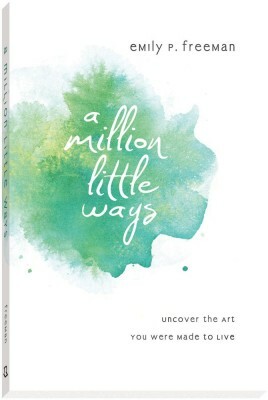 Discover the art in a quiet word, a hot dinner, a made bed, a grace-filled glance, and a million other ways of experiencing God in the world through the simple human acts of listening, waiting, creating, and showing up. We arrived here as art and we spend our lives uncovering the beauty we have to offer. As the community of humanity, we will do that in a million different little ways.